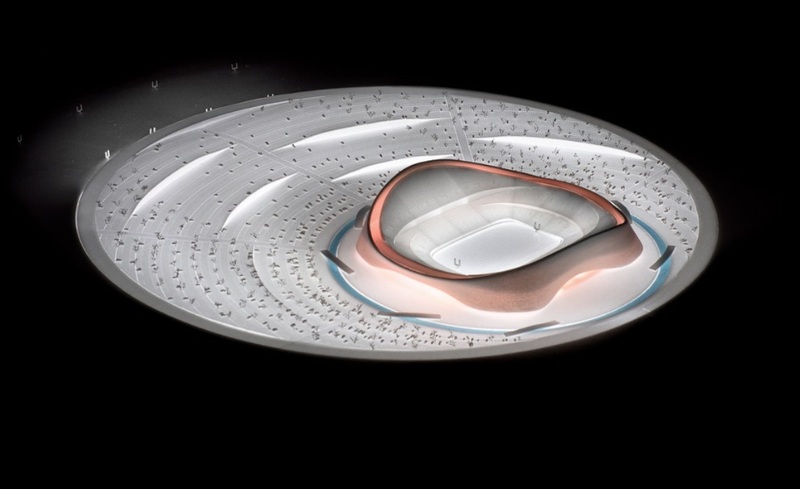 Key design features: one bowl where all spectators can see each other (no traditional NFL arena tiers), wrapped in a golden metal mesh. The building is set within an amphitheatre-like park that can mutate into a performance venue for up to 100,000 people. 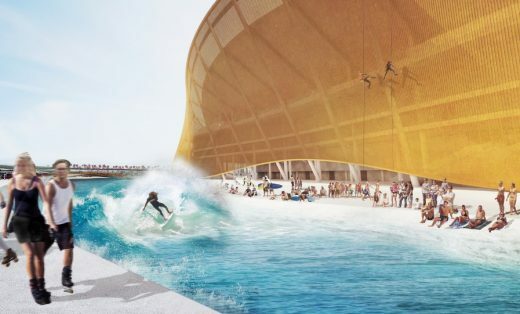 Danish architect Bjarke Ingels descirbed the architecture as being “designed as much for the tailgating, like the pre-game, as for the game itself”. There will be 4,000 sqm of exhibition space for a Redskins Museum and 9,000 sqm of offices, club rooms and training facilities. Parking for 25,000 cars would be set beneath the tiered landscaping, allowing vehicles to drive up close to the stadium. A ‘moat’ has been designed for surfing, kayaking, and, in colder months, ice skating. Finally, four full-sized training fields are also included. There seems to be no stopping Bjarke Ingels! 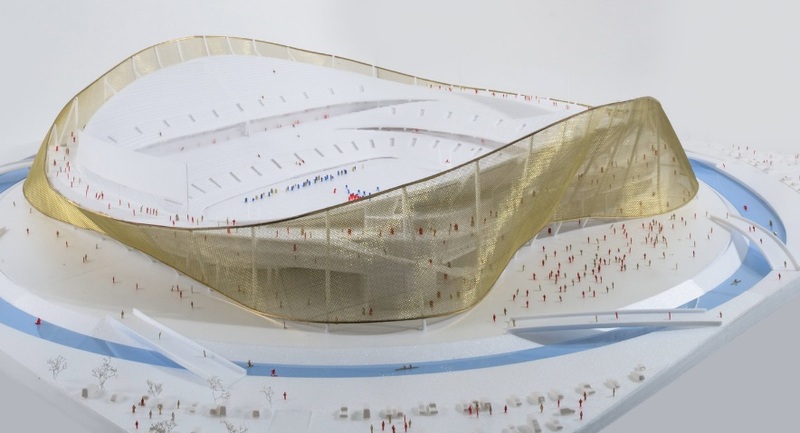 The up-and-coming Danish architect’s next major US project looks like it will be a new stadium for the Washington Redskins in Washington DC. BIG are yet to design a sports arena so are likely to team up with an architecture experienced in National Football League building design. Since BIG opened its New York City office in 2010 they have won a series of high-profile projects across the United States. Current projects include the new Google headquarters in North Bayside, Mountain View, California and the 2 World Trade Center in Manhattan. The Washington Redskins have been considering relocation from their home in Maryland to DC or Virginia. Daria Pahhota, BIG Press Manager, told the Washington Post: “We are working on an NFL stadium, but we can’t identify who the client is.” Architect Bjarke Ingels however published a Redskins-related post on his Instagram. The Redskins currently play at the FedEx Field, an 82,000-seat arena in Maryland that opened in 1997. It was designed by HOK Sport, now known as Populous. The stadium has been criticised because views of the field are blocked in certain areas, forcing fans to stand to be able to see the game. It is also difficult to reach by public transportation, as it is a mile away from the nearest metro station. 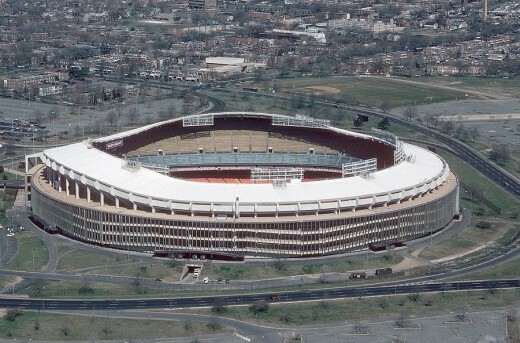 Sports Illustrated magazine said the oval-shaped stadium lacks distinguishing features and “looks like a big slab of concrete…It has all the charm of an office park or a suburban mall, which it will likely end up being someday”. Other BIG projects in the US include the Smithsonian south campus redevelopment, Via 57 in New York City, The Grove apartment blocks in Miami, Pittsburgh Lower Hill District masterplan and an office building in Philadelphia’s Navy Yard. 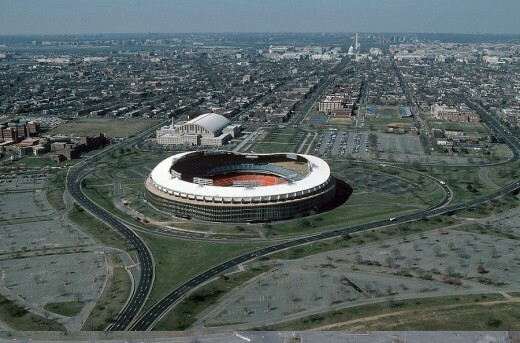 FedExField, the Redskins’ current stadium, is regarded as one of the least aesthetically appealing stadiums in the NFL. The arena has been criticized regarding its functionality and convenience. BIG has entered the prestigious architecture competition to redesign Camp Nou Stadium in Barcelona. United States Capitol Washington D.C.